Ammophila procera (Thread-Waisted (Digger) Wasp). Size: approx. 30-40 mm. Photo: 06/25/11, 10 am. One of my coolest picture so far. This wasp was massive! It is a thread-waisted (digger) wasp. 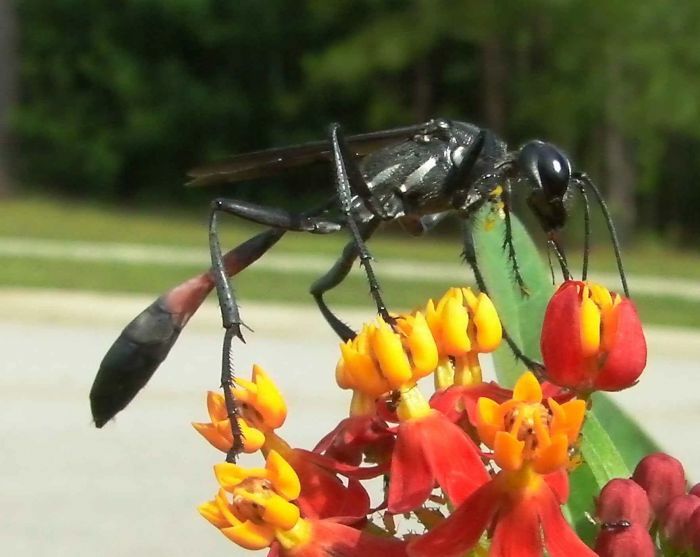 The scientific name is Ammophila procera. They are solitary wasps and females dig and provision chambers for their offspring. They prefer sandy clay soil and hunt hairless caterpillars to feed their larva (one per egg). I initially thought that it's A. nigricans but a bug guide expert corrected it (thanks!) - this one has silver lines on its thorax.